For courses in C++ introductory programming. 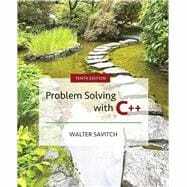 Now in its 10th Edition, Problem Solving with C++ is written for the beginning programmer. The text cultivates strong problem-solving skills and programming techniques as it introduces readers to the C++ programming language. Author Walt Savitch’s approach to programming emphasizes active reading through the use of well-placed examples and self-tests, while flexible coverage means the order of chapters and sections can easily be adapted without sacrificing continuity. Savitch’s clear, concise style is a hallmark feature of the text and is supported by a suite of tried-and-true pedagogical tools. The 10th Edition includes ten new Programming Projects, along with new discussions and revisions. Note: You are purchasing a standalone product; MyLab™ Programming does not come packaged with this content. Students, if interested in purchasing this title with MyLab Programming , ask your instructor for the correct package ISBN and Course ID. Instructors, contact your Pearson representative for more information. Walter Savitch is Professor Emeritus of Computer Science at the University of California at San Diego. His interests include complexity theory, formal language theory, computational linguistics, and the development of computer science education materials, including several leading textbooks. He holds a PhD in mathematics from the University of California at Berkeley.